LAKEWOOD RANCH, Fla. (Dec. 3, 2016) - A first half brace from Essosa Emovon and second half double from Keith Larson earned Vardar U-15/16 (Mich.) an impressive 6-0 victory against Weston FC U-15/16 (Fla.) in Development Academy Winter Showcase play on Saturday afternoon at Premier Sports Campus. It was Weston that had the better of the chances inside the first 10 minutes, as Jose Rivas' crack from distance went just over the bar before Federico Tellez's combination at the top of the box led to a key save at the near post by Vardar goalkeeper Justin Lupenec. From there, Vardar slowly put their mark on the game, pulling ahead in the 23rd minute thanks to an own goal. Assad Bujaidar worked well up the right, before crossing at the end line where Weston FC defender Pablo Vargas made an unfortunate touch into the net. The side from Michigan doubled their advantage five minutes later. Following a mis-cleared corner kick, Bobby Harris collected the ball on the left and swung his cross into the six-yard box where Kameron Bloye extended with his right foot to redirect past Luca Mancuso. Vardar earned a penalty kick just after the half-hour mark when Gianni Ferri went on a gallivanting run before being upended in the area. On the ensuing spot kick, Esosa Emovon sent Mancuso the wrong way as he rolled his take inside the right post in the 32nd minute. The other side of halftime brought a fourth Vardar goal in the 43rd minute. Emovon laid off for Bloye at the top of the box where he let loose on a low drive that Mancuso parried away, only to see Emovon expertly put back the rebound for his second of the game. Weston FC came close again in the 48th minute when Tellez played a quick ball through the Vardar defense, releasing Rivas into the box, but Lupenec cut the angle just enough to force his shot just past the post. Turning the other way, second-half substitute Keith Larson got in on the scoring action for Vardar when he picked up the ball just outside the area, split the Weston back line and fired a low drive inside the right post in the 66th minute. 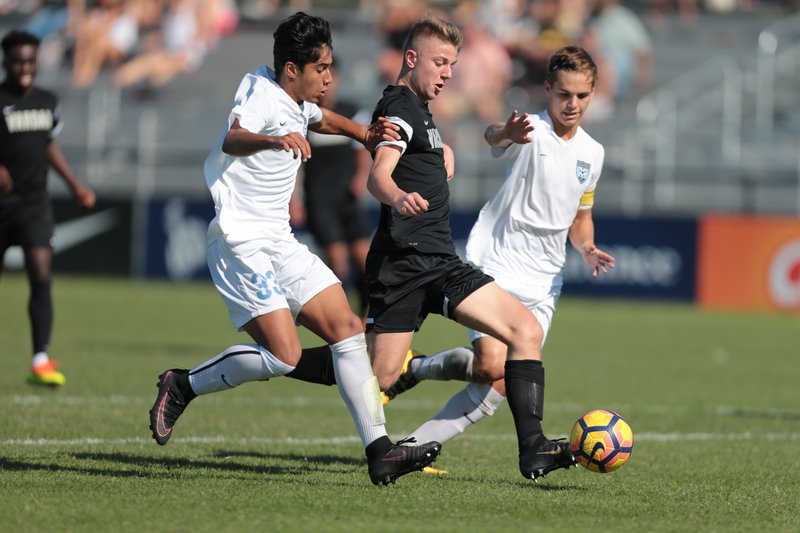 Just before the close of the 80-minute match, Larson grabbed his second, when a corner kick from Luciano Errecalde on the left swung to the six-yard box where the towering target forward nodded down to beat Mancuso, giving Vardar a well-earned 6-0 victory. With the win, Vardar U-15/16 moves to 9-3-1 on the year and will close out the Winter Showcase on Monday at 11:15 a.m. ET against Real Colorado. Weston FC falls to 9-2-1 and will next take on Oakwood Soccer Club U-15/16 at 9 a.m. ET on Monday.